Phineas Gage was swift, capable, responsible. He was physically fit and a leader of men. These qualities made him at the age of 25 a supervisor on a Vermont railroad construction project and might have helped him rise through the ranks to a senior management position in that branch of engineering. But the smooth track of his life was shattered in a single instant. A certain part of the terrain was littered with huge rocks. It had been judged less costly to blast them with gunpowder and build a straight railroad, than to detour round them. It was 1847 and Alfred Nobel being only 14 had not yet invented dynamite. The established blasting method was to drill a deep hole in the rock, pour in gunpowder, poke in a fuse (a long string made of gunpowder wrapped in paper) and cover with sand or clay. This had to be firmed up by tamping with an iron rod, so that the force of the exploding gunpowder would radiate in all directions, and not just back up the drilled hole, as from a gun. On this particular occasion, Gage was preparing a number of blasting-holes. He found it a monotonous routine, something he could do with only half his attention. He was interrupted by a question from a fellow-worker, which took longer than anticipated to resolve. When he resumed, he forgot he hadn’t yet added sand to the current hole. He tamped the naked gunpowder with his iron bar. It sparked against the rock and set off the powder like a flintlock gun. The bar shot out with the force of a cannon-ball, passing through his skull. That single moment is the basis of his enduring fame. 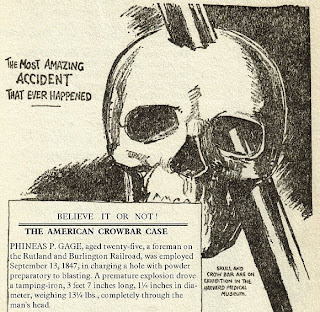 My own introduction to Phineas Gage was The Omnibus Believe It Or Not, by Robert Ripley. I was seven or eight, and must have skipped the boring sentence where it said that “[the crowbar] made its exit at the junction of the coronal and parietal sutures ...” I was more influenced by the accompanying drawing, which showed the bar at the moment of passing through, going into his skull on one side and emerging at the other. For nearly sixty years I carried a mental image of Gage staggering along a track for assistance with the crowbar still in his head, though in truth it had passed through swiftly and out the other side, taking bits of brain with it. So when the story of Phineas Gage came up again in a book I’ve been recently reading by Antonio Damasio, it was familiar, like a Bible story woven into the fabric of my imaginative life. As for Damasio, my connection with him goes far beyond any academic interest in neuro-science. David Mickel put me on to him after my miracle cure from chronic fatigue syndrome. That illness was the great rock which blocked the track of my life. Must I curve around it, accepting its permanence? I didn’t know until a time when with all the force of my survival instinct I cursed it and rebelled against my fate. Dr Mickel’s therapy was the blasting process, miraculously sudden and effective, like a single explosion. Later, when I went to Edinburgh to study with Dr M himself, he recommended The Feeling of What Happens, by Antonio Damasio, whose earlier and more significant book I’m reading now: Descartes’ Error. It starts with an account of how Damasio’s wife Hanna, using Gage’s damaged skull preserved in the Harvard Medical School, made a computer simulation to work out which areas of his brain had been destroyed. Gage was a living miracle, but it’s well-known that his survival had a dark side. All his basic faculties were intact but his personality was changed for the worse. To his friends he “was no longer Gage”. The detective work was to discover, comparing Gage with modern cases, the functions of the brain-cells destroyed by the passage of the tamping iron. We now know that they were from the region which processes emotion. For centuries it had been assumed that emotion was the enemy of calm rationality but Damasio discovered that to be wrong. The new unemotional Gage was unable to make sensible decisions about how to run his life. He couldn’t get his old responsible job back. He was virtually unemployable after the accident, but not through what we normally think of as “brain damage”, i.e. loss of “intelligence”. You can read his doctor’s notes in this Wikipedia article, for an account of his personality change. Why is the book called Descartes’ Error? The reasons are quite deep. I am just giving a summary here. Descartes, the “father of modern philosophy” saw mind and body as profoundly separate, with a single interface or bridge in the pineal gland. To Damasio, there can be no mind without body; no thinking without an awareness of the physical, whether it be our own body-awareness or an interaction with the outside world. His idea, derived from neurological observation, changes everything. It makes religious theories obsolete: not completely wrong for they posited the existence of soul and God as the unseen source of the wonders perceived with senses. In Damasio I see a line between arid theology on the one hand and arid atheist science on the other. Damasio is too erudite for me to explain further. I have understood his ideas not through the study of his books but the reintegration of my own self following a miraculous cure. I have had to find my own language to describe it. I have said in this blog that man is an animal, despite being overweighed with a huge intellect, like an elk with antlers, or a peacock with a gorgeous tail. I have discovered my own animal nature. My passions are governed by survival, my ecstasies induced by Nature, for I am its child, sucking at its teats. I am nourished by the paths that lead out from cities, and the ancientness of the open sky. I was educated with a bit of Latin and less Greek; forced into team games---soccer and cricket---as sole recognition of body. The headmaster viewed all deviant behaviour as incipient homosexuality. We must act as a pack of hounds, with him as chief huntsman. My rejection of competitive pursuits was seen as primitive, uncouth and shameful. I took refuge in solitary dreaming, out in the ploughed fields digging up fragments of clay pipes, discarded by the ploughman when they broke; or trying to bring down birds from the sky with a slingshot I’d invented, made from a springy stick with clay stuck to the end. I tried in adult life to hunt with the pack. I allowed marriage and children to force me into well-paid desk-drudgery. I tried to find in religion, or rather its mystical soul, a language and guide for the unruly impulses I felt. But how could religion work, when it was based on supremacy of soul over body; all life’s treasure leached away into the abstract realm? Religion was and is a cruel assault on a child’s mind. Like corporal punishment, its use has diminished here in England, to be replaced by the atheistical religion of science, capitalist economics and modern medicine; which is far worse. I’m for “spirituality”---except that it’s wrongly named---and always have been: but not for “beliefs”. Phineas Gage was the first martyr and saint of neuro-science. Damasio does more to explain what makes us tick than any psychology or theology I have read. But it can never make experiential religion or mystical awareness obsolete. For we possess the gift of direct knowledge, beside which science, for all its “evidence-based method”, is as speculative as theology. Nothing in the laboratory tells us as much as our own primitive awareness. If someone tells of the visitation of an angel, or the voice of God heard on a lonely mountain-top, why should I not respect that? How else express an experience, but as it appears to you? Life is no less awe-inspiring, experience no less mystical, when we get closer to understanding the body and brain, whose soul is in every cell and neuron. [sigh] If it were only that simple. Simple .. ah, it is, am an animal .. heh. I especially liked the part where vincent compares human intellect to an elk's antlers.